I love the Christmas holidays. However, like many others, I sometimes struggle to avoid them feeling like one long TO DO list from hell, instead of the celebration of love and light that they can be. The trick for me is to intentional every day. What makes me happy? What makes the people and other animals that I love happy? One of the things that makes me happy is giving gifts. I’m sure it’s less altruistic than selfish–an excuse to buy cool things without feeling guilty–but it makes me happy. At the same time, I have no interest in spreading around stuff for the sake of stuff, and filling up the earth and water with yet more pollution. It makes me happy to find ways to give gifts in a thoughtful way, and it makes me happy to have a conversation with you all about how to do that for the dog lovers in our circle. I’ll give you some of my ideas; I’ll love hearing yours. What about a custom PHOTOGRAPH of your friend’s dog? Maybe you have a good one you could frame and surprise them with. Or put it onto a coffee mug? Or give them a gift certificate to a good professional photographer, one that you’ve researched and know does a good job with dogs. Another fantastic subscription would be one to the Whole Dog Journal. It does a great job evaluating dog food (they even go to the manufacturer’s plants) and other health-related topics. I pretty much wouldn’t leave home without it. OFFER TO DOG SIT. Granted, this is a big present, and only something that some of us with flexible schedules could offer. But what a wonderful gift to a good friend! “You go do something well-deserved and heavenly, and count on me to take care of your dog.” This is especially welcome to people who have dogs with issues. If you are a good friend and know dogs, they can count on you to 1) not get bitten, 2) avoid dog fights and 3) clean up vomit or feces as if it were nothing. Potentially best present ever? BUY THEM AN EXPERIENCE. It’s all about the experience now, right? Your knowledge of your friend and your imagination is your only limit. 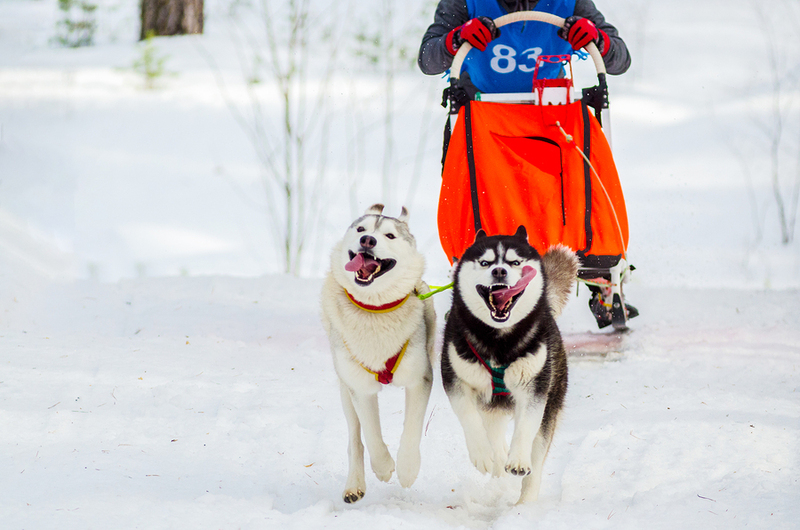 How about a weekend dog sledding (you dog sit their dogs of course!) Okay, maybe not a good idea for those of you in Georgia or Arizona. But you could pay for a weekend seminar on canine behavior, or sheep herding, or tracking or… you get the idea. One book I’m thinking about getting myself is Mind Games for Dogs. At the moment it is still reasonable weather for working sheep. (Cold yes, but not too slippery and much better than hot for me and Maggie.) But that is not going to last long. It’s barely into December, and it is guaranteed that we will have days in the future that are well below zero, or too icy to be safe, or both. 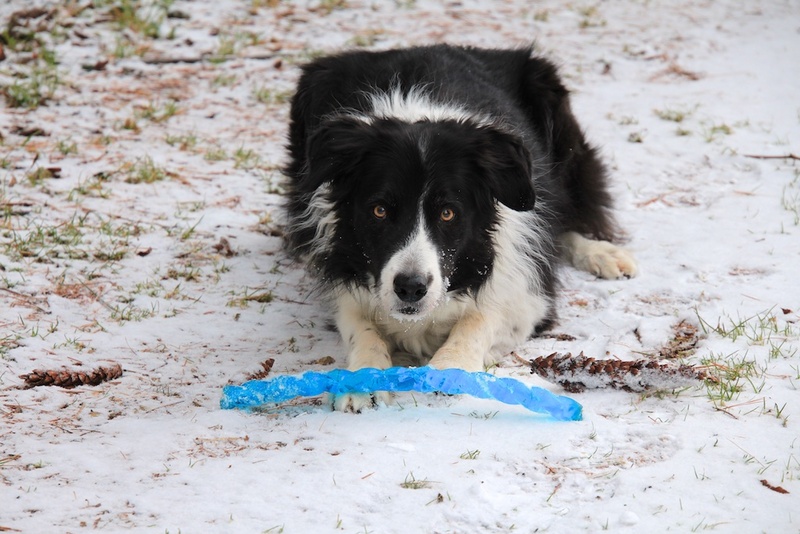 I could use a few new ideas for tricks to teach the Border Collies. If you are stuck, you can always give a GIFT CERTIFICATE to your favorite local pet store. Who doesn’t need something for their dogs, from food to toys to bedding? You could even go to the meat department of your local market–why not wrap up a chuck roast for Chuck? MEANWHILE, back on the farm: If anyone has seen the sun lately could you remind me what it looks like? Color? Shape? I don’t remember. But we did get a sprinkling of snow on Sunday, which does perk up our surroundings. But life is still a study in black, brown and grey. 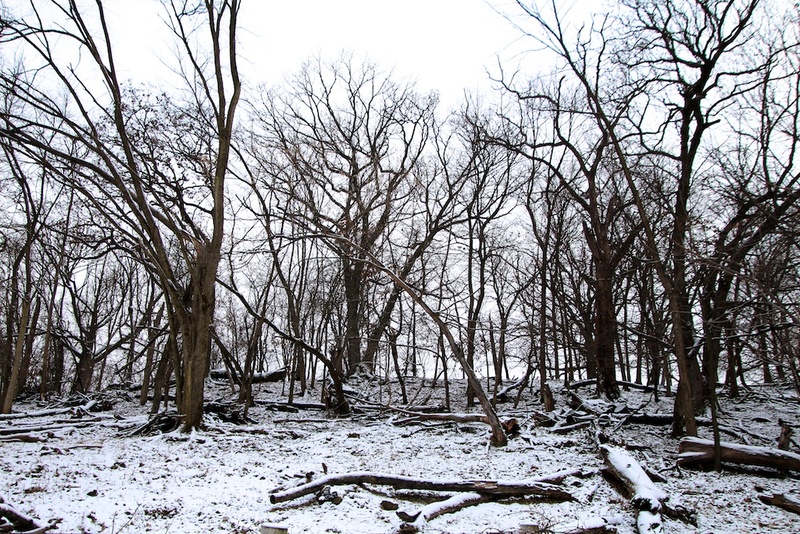 Here’s a photo of the woods above the barn. No, I didn’t take it in black and white. Ah, a sprinkle of color! 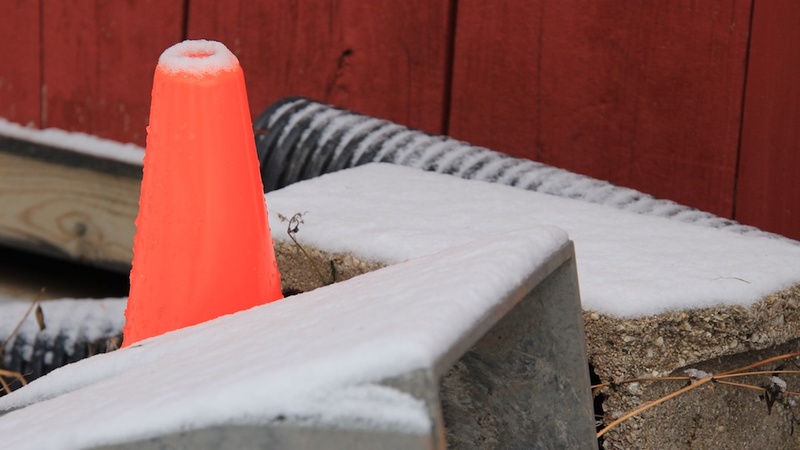 Even a plastic orange cone looks good in weather like this. Willie would like me to put down the damn camera, thank you, and play with him. « New Camera Lens, Oh Boy. Yes, I am familiar with the ‘study in black and white’, although we did have one full day of sun today with blue skies and fluffy white clouds, me and the dog found a sun spot outside after our walk to soak up as much vitamin D as possible, but that’s Michigan. 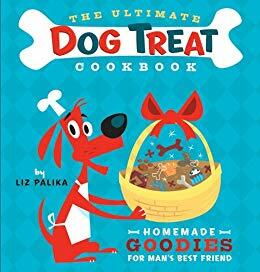 Love the idea of the chuck roast for the dog and home made treats. I love the holidays despite the moments I am overwhelmed. New collar with poinsettias for the dog, cookies for me, egg nog, carols, cards and gifts, and the feeling of good will in most of the people I encounter! I can’t tell you how much I enjoy your writing! Merry Christmas to you, Jim & the dogs! Everything rather went on hold when I found a small mammary lump on Poppy. Four weeks later she is almost recovered from mastectomy and spay (the tumour was benign) but it reminded me that the future is uncertain – and to live in today with my dogs. So if the weather is amenable we go for a walk, and housework can wait! This year, Lucy, our bossie aka bc/aussie, has asked that in lieu of gifts, contributions are made to shelters affected by hurricanes and wildfires or the humane society’s emergency rescue program. We survived hurricane charley in 2013 ( cat 4) and are very sensitive to the reality of people abandoning their animals when they seek safe shelter. We are not really Christmas people, but I do make an annual secular card to send out to friends and family and those in between that prominently features the dogs. I love looking back at past year’s cards and the dogs long gone. I was given a gift certificate for a day of dog sledding several years ago. It was one of the best presents I ever got. It was so magical when we hit a frozen lake, the dogs went silent and dug in, and all you could hear was their rhythmic breath and the sled’s runners. I’ll never forget that feeling of being in unison with animals and the icy winter landscape. She gave me a wide variety of experiences — a full team and the speed that brings and then just a few dogs and how the work and the travel changes. It also included lunch in a yurt. Thanks for reminding me how wonderful that day was; I hadn’t forgotten, but it was piled way in the back. This year my gifts will be for experiences instead of items…I have purchased gift cards to restaurants that are each locally owned..I figure family and friends would enjoy a lunch or dinner out…time to relax and enjoy….and it feels good to be supporting small businesses…Merry Christmas …. Thanks for the great ideas. I am way behind this year so now maybe I will get started. I can’t think of a better gift book to give a dog person than your Other End of the Leash!! It was informative, funny, and heartwarming. Thank you for writing a blog, I look forward to reading it! tremendously disappointed at the recommendation of Whole Dog Journal, especially as it pertains to food, as they do not rely on science-based criteria and seem to have only recommended diets that are implicated in the recent dilated cardiomyopathy research. i am not really into christmas gifts that are disposable or end up in our oceans/landfills either…i usually make homemade granola in mason jars for my friends during the holiday season. the one concession i do make to the holidays is making an advent for my dog, paco…i got small paper gift bags which i put treats in, and string them up with clothespins and carded numbers counting down to christmas. i can re-use everything for the next year. he really looks forward to each morning for his goodies! :o) we wish you and your readers a wonderful holiday season!! As a gift for people, if you know a good human massage therapist, a gift of several massages to that human friend is always much-welcomed! Sometimes, massage therapists are flexible, and might let them spread their sessions throughout the months or year, at the frequency that works best for them. I’ve recently learned, the same goes for canines. I.e., As a gift to a canine friend, if you know a good canine massage therapist, a gift of several massages to that canine friend is always much-welcomed! Sometimes, canine massage therapists are flexible, and might let them spread their sessions throughout the months or year, at the frequency that works best for the pup. I love the massage idea for either species! What a wonderful idea! I love it, think I’m going to start it myself. Willie, Maggie and Tootsie thank you. Even though we disagree, I truly appreciate you taking the time to write. Perhaps this is a good topic for a blog sometime. I will say that the DC issue is far more complicated than it looks superficially. 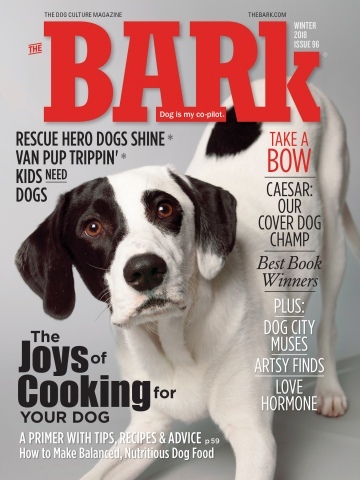 Dr. Linda Case wrote a great article in Bark about this issue (see also her newsletters), making it clear that the issue is far, far more complicated than has been argued. I too had one magical day with sled dogs, and the sound of it is what I remember best. Silence except for dog’s breathing and paws slapping the earth. I’m so glad you got to experience it too! What a wonderful idea. I too have made contributions, and thank Lucy for the reminder to us all. Low lights, G and T’s and hungry guests all sound like a good idea to me! Sweet kisses to Poppy, may she be with us for many more holidays. Oooh, salsa, can I have some? Never have made a good version myself. Hmm, the sun is round and bright! Brings a smile on your face! Here in California we are lucky to see it a lot! Speaking of California, I love your books and I would love to see you on one of your presentations! Any plans to come here! Sending you sunny greetings! Thanks once again for that uplifting feeling I get each time I read one of your blogs/postings. I agree, The Other End is a great gift! Just popped by to say Merry Christmas! May each and all enjoy the holiday season with loved ones and with peace in their hearts. I love that toy Willie has. I wish my dogs did. They just don’t play with those toys. Too bad for me. This year I did not have the traditional Thanksgiving sink backing up or power outage. The septic overflowed. And then after it was fixed, the dogs ran through the septic mud. But the 12 adults, two todlers and six dogs had a wonderful family Thanksgiving. While I assume most folks reading your blog are dog owners, it’s tough to swallow when you suggest offering dog sitting as a gift. I have been a professional pet sitter/dog walker for 11+ years. So many things can happen. They usually don’t, but those of us who have seen it all I’m going to worry about suggesting pet sitting service as a gift. Ideally, the person doing the pet sitting “gift” really understands and has studied dog behavior, is unusually perceptive in terms of health issues, knows how to keep the home and yard secure and has access to a vet outside of business hours. Did you know if a person pet sits for another they are potentially legally liable for any damages to the home, death or injury or a pet, etc.? I have broken up dog fights safely, provided emergency care, alerted owner(s) to potential health issues, kept the house/yard locked and cared for, kept crazy relatives with a key (seriously) out of the house, called the police or alarm company when necessary and shown up when a travel advisory says driving isn’t allowed. I have curled up on the floor of my vet’s office with a dying golden retriever in my arms because his kidney disease progressed while his owners were gone. Had I not recognized his decline and gotten him to a vet he would have suffered longer than necessary. I held him while he was euthanized because I am responsible, completely responsible for the dogs I care for. I’m not saying friends can’t pet sit for friends, but it is so not as easy as it sounds. Thanks for the reply. I’ve read that but I’m primarily following Dr. Joshua Stern’s work— he recently published an article in JAVMA. You’re correct that it’s *very* complicated, it’s just disappointing to see someone who is so scientifically motivated sharing VERY unscientific information. We should want all of our dogs’ foods to be balanced and tested, which WDJ does not at all seem to care about. Thanks Lula, I’ll check out Dr. Stern’s work. As always, I’ll take your comments seriously and continue to evolve and learn. Hi, I’m new here. Just checked out “Mind Games for Dogs’ on Amazon, and the 9 reviews weren’t very positive overall. I wonder if you’ve seen the book? Wasn’t pricey, true…Happy Holidays! Thanks for asking Mary. I haven’t gotten it yet, but given the price, if it has just one new trick in it it’ll be worth the price to me. It’s a bit like seminars… If I learn one new important thing it’s worth it! Some great ideas! I have to smile though as we have a small family here in Oz: a core unit of 4 and we often “request” our presents. 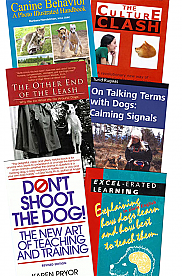 So I was granted with my requests: The Other End of the Leash – I”m only 2 chapters in and already raving about it – and For the Love of a Dog- my other half has already picked it up and commented on the dog behaviour photos – and If Bones Would Rain From the Sky. . . I also got a non-dog book Mindset by Carol Dweck, she talks about our potential and how labelling ourselves (and others) can limit our achievements (I’m a teacher so will be very pertinent- I was inspired by an awesome website and interview from Maggie Dent about raising boys, fantastic book!) Bought Maggie’s book on being a good teacher and she recommended Mindset. I now have to “ban” myself from buying anymore books until I’ve read the new additions. . .plus have several library books on the go too. Love the calendar idea from a rescue or shelter! Or even a contribution of books, food, etc?